Cairns are found all over the world. They have spontaneously arisen in many guises, in many cultures, in many climates and for many purposes. Some mark the path, others are burial chambers for the dead, some contain messages from those that have gone before to those that follow. 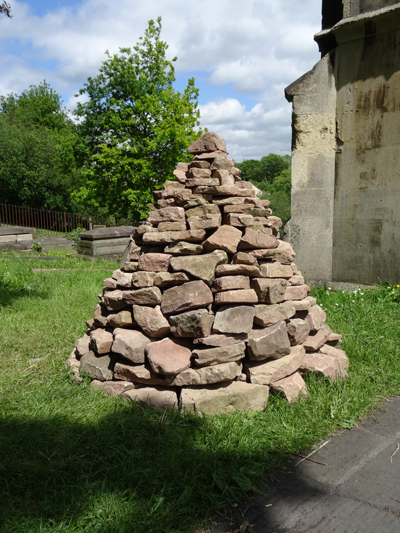 I had been thinking about memory, and about how and why we as a species chose to erect monuments to people, and to events, and how one of the simplest and most enduring forms of remembrance is to erect a pile of stones. It has significance. The significance is not written on a plaque to be read if you’re just curious, by its very presence it conveys the importance of something. This could be as simple as reassurance that you are on the right path, or as heavy with meaning as the place where your ancestors lie, and who watch over your land still. Cairns are a residence of memory. 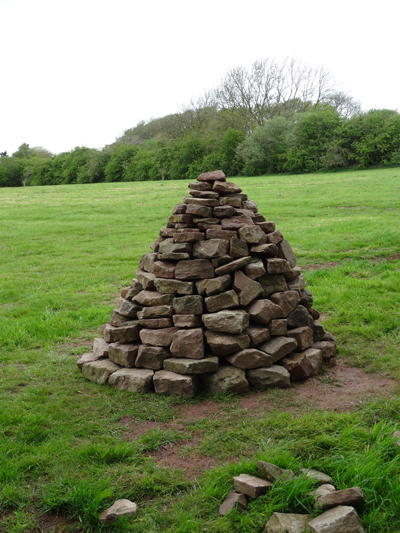 I had started to use cairns, or piles of stone in some of my paintings and I was struck with a desire to build one. I was aware of the importance of the audience investing in the significance of the structure too. If they didn’t feel any connection to it then it might as well be a garden feature. Just another pile of stones. If the work was to be about memory then the viewer had to feel part of that. Almost universally people leave offerings to loved ones at special sites. This can be flowers at graves, lighting a candle in a church; in Japan I had noticed that small carved figures can be left on stumps or rocks at shrines, and of course often a rock is left on a cairn. I wanted visitors to feel enabled to attach significance to this pile of rocks. I was bringing a structure from the wild, where its very presence had resonance, to a place where it would have none and there needed to be a reason for that. 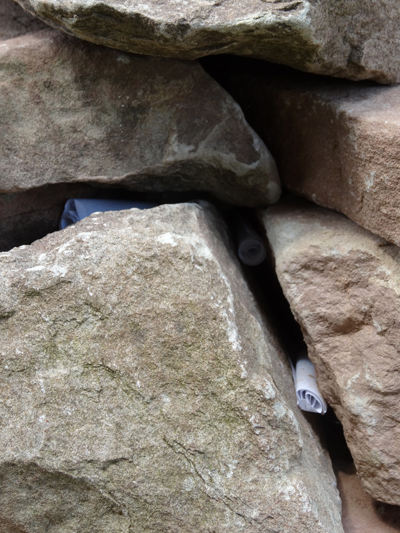 I would encourage visitors to participate in the work by writing a memory on a slip of paper and place this, rolled up, into the cairn in the gaps between the rocks. I always had in mind that I wanted visitors to be free to give whatever memories they wished to give, without fear that their privacy would be compromised. I would take all the memories at the end and seal them in a jar, forever unread. Their participation and investment in the work would give it significance. To me, the building of it was the important thing. I knew what I thought the piece would be about, but I also knew that in the act of building it I would understand more. The work of building would be my investment in the piece. It would be my way of connecting to those people in the past who had also built cairns. The stone I was to use was largely Carboniferous Limestone, located about half a mile up the road from where I live. They were the rejected stones from the renovation of buildings in an old farm. They had been collected from the field where they had been dumped, into a huge new pile, ready to be used in a new building project. Most of the stone was quarried from less than a mile away from where they now lay. The pile was at the lower end of a field, on a hill, with the access to the field at the upper end, around 80 meters away. I would have to move the stone I wanted to use up the hill where it could be loaded for transport to the exhibition site. I decided that as I still had nine weeks until the exhibition opening I would hand carry the stones up the hill, building cairns as I went. I selected a quantity of stones from the large pile and spread them across the ground. 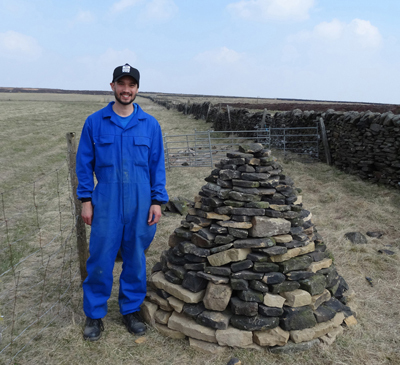 I had no idea how many I would need in order to produce the size of cairn that I wanted, so I guessed, and started to build using my eye and some research from “Dry Stone Walling: A Practical Handbook”. Amazingly enoughI produced a solid if somewhat oddly shaped cairn around 6 feet in diameter and 5 feet high. The book had been recommended to me by John Coombes, a dry stone waller from Derbyshire I had been put in touch with by a friend. He had agreed to let me come up to the Peak District to work with him for a couple of days and I was very grateful for the opportunity to learn. It was early April and in the previous week the weather had been terrible, but as I travelled up to the High Peaks the sky was blue and is was gloriously warm. 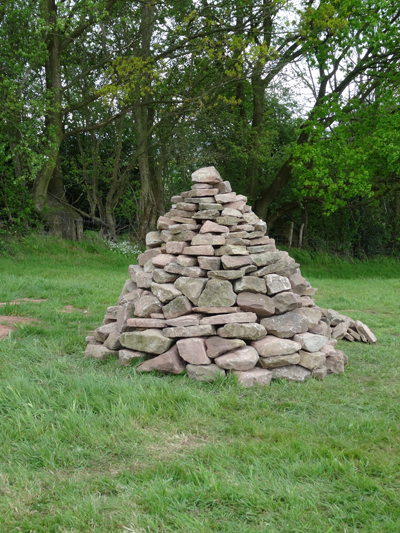 John had very generously decided that the best way to learn to build a cairn was not to help him build a wall, but to get straight on and build a cairn. The stone in this part of the world was very different to what I would be using but while building we talked about strategy and technique and the most fundamental aspect of making the final structure safe. I was also able to have a hike to look at some enigmatic local monuments including Carl Wark, where a wall of boulders - all at least a tonne in weight - protects a rocky promontory, itself covered in enormous stones. It was a great reminder of the depth of history that this land has and the memory stored within it. Returning from the Peaks, over the next month I took apart, moved and re-built a further three cairns, all a little further up the hill until I had reached the gate. By this time I had moved what turned out to be almost three tonnes of rock around 80 meters up a hill. This project had been for me about hard graft and learning. The process of moving the stone, learning how to build it into a solid structure, and learning about the stone itself had all become part of the meaning of the piece for me. By this stage I knew many of the individual stones themselves. In the final practice cairn and the final build I was helped greatly by Ruth Fairfax, who knew her way around a dry stone wall and built with me tirelessly. It was thanks to her that I was able to make the final build work, as we had a very tight timeline for construction onsite. 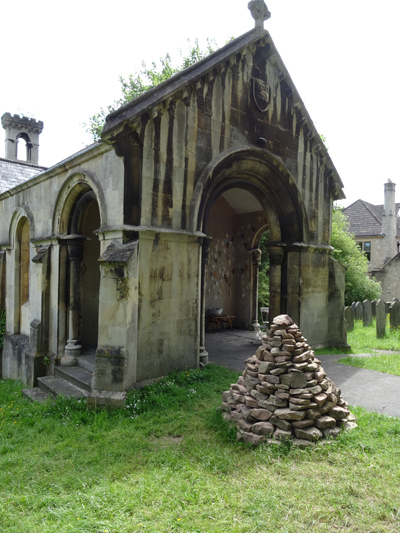 All along I had been concerned with the logistics of how to get the stone the 80 miles down to Bath for the exhibition that the cairn was to be built for: Love and Death @ Walcot Chapel, as part of Fringe Arts Bath. Richard Horne came to the rescue with a mini digger trailer and crates to load the stone into. It was only when loading the trailer that we realised just how much the stone weighed. The calculations John and I had made initially were not correct. I think I had been too greedy and made the cairn too large. At any rate, we were nearly a tonne overweight. Sadly this meant that some of the stone had to be left behind as we were unable to transport it all to Bath. In the final build this turned out to be not too great a loss. We built up, with a slightly slimmer base. The resulting cairn was a beautiful size. It was on a human scale, at 130cm in hight and with a base diameter of 156cm. When viewed from a distance it could appear quite small and delicate, but when in close proximity its mass becomes apparent and makes it an imposing structure. It contained very nearly two tonnes of rock. It was only at this stage that I decided to call it Stone, Air, and the Rest. The stone was the obvious part of it, but just as important is the empty space between the stones, filled with air, that can make such structures feel lace-like in their delicacy in places. The “Rest” was what participants would bring, their memories on paper and the trust they attached to the structure, and to me, in keeping them. As the exhibition passed I saw the deposits of the scrolls of paper in the gaps between the stones. I was delighted not just because I had been afraid that nobody would engage but also because this was what created the meaning of the piece. By entrusting the cairn with their memories - their emotional investment - participants gave the cairn authenticity and significance. When participants leave a memory it adds to the emotional gravity of the monument, attracting more participants willing to invest in it, and after a period of time, gives that monument an authority. When the time came to take the cairn apart we loaded the stones back onto the trailer to be returned to the pile they had come from. 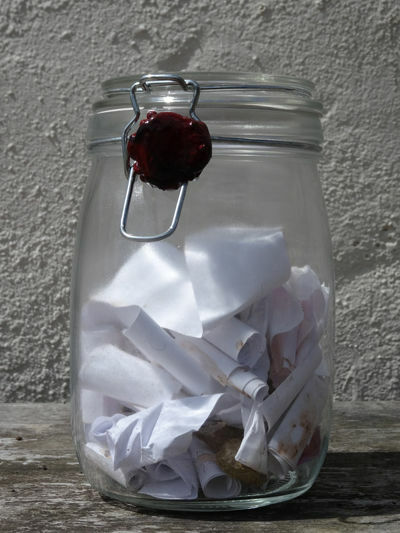 The scrolls of paper - along with some of the dust and debris from the rocks - were sealed in an airtight jar, never to be read, and never to be exposed to the air again. 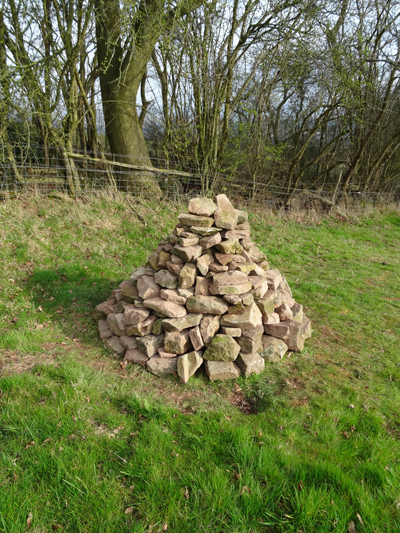 Many thanks to Tracey and Roman Iwanczuk for lending me their stone and allowing me to freely build cairn after cairn in slow procession up their field over a couple of months. John Coombs for being so generous with his time and expertise, making sure I knew what I was doing. Thanks to Ruth Fairfax for the build and Richard Horne for the transport and loading and all your logistical help. I really couldn’t have done it without you both. Many thanks to Geoff Dunlop for being a fantastic organiser and curator of Love and Death. It was a great exhibition and I hope I have the pleasure of working with you again. Finally many thanks to Arran Hodgson and Scarlett Mosnier and all at Fringe Arts Bath for having me along, letting me sleep on your sofa for a few nights as a total stranger and being thoroughly welcoming.